I haven't exactly spent the last few days sitting in the sun! My return to the UK is always a mix of catching up with friends, tidying my neglected garden, doing jobs and shopping. After six months away the cupboards are bare but the autumn leaves are still blowing around the garden! 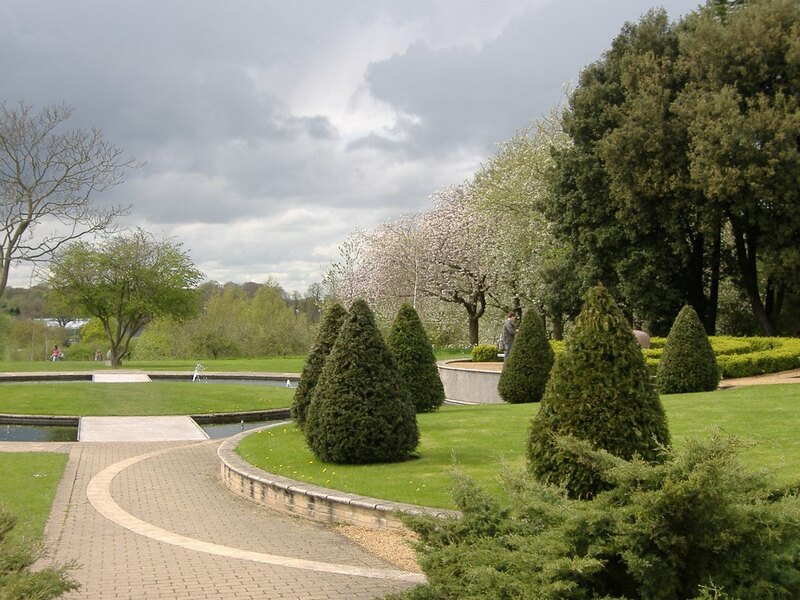 I had contemplated a trip to Anglesey Abbey to the winter gardens but opted for a quick visit to the University campus to see what was in bloom there. A few nice winter pictures in Sunday's sunshine and one very pleasant surprise. Amongst a group of Helleborus orientalis that I planted six years ago, I spotted a plant with very striking black flowers and chocolate foliage. I guess its a chance seedling as I've never seen it before and it was just a small plant tucked close to one of the big clumps. I'm not a hellebore expert by any means and so have no idea whether this is in any way unique - I doubt it is, but it was a pleasant surprise! The true H. orientalis comes from Greece and Turkey and has greenish white flowers. Most of those available nowadays are actually hybrids with other species. Presumably dark colourings are recessive traits so just appear occasionally - somebody enlighten me? Pink and white Helleborus hybrids from which the black one presumably came. 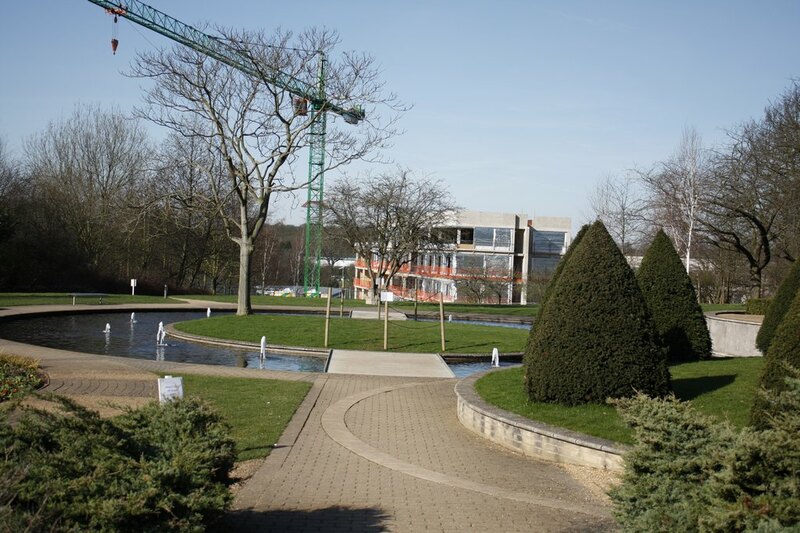 I am always interested to see new developments on the University campus but sad to see how they sometimes impact on the landscape. It was a battle I often fought over the fourteen years I was there and rarely won. Buildings trump landscape time and time again! My latest shock was seeing the new hotel being built at the back of the Conference Centre. Although set in a hollow, it is horribly dominant at the back of the Millennium Garden, a monstrous focal point at the end of the main vista. I seem to recall being told that fifty or so trees were felled to accommodate it. One wonders whether the architect was even aware of the garden when he designed it. Looks like some new tree planting is needed! Enough said! That dark hellebore is great. Hopefully it can be segregated from the mass planting and bulked up. I much prefer the dark and strong colours for Hellebores rather than the pastel shades. ...and I can confirm the you don't have word verification on your messages, so either you didn't have it before, or you successfully turned it off now! Looks like spring has arrived in the UK...you are not in the Coachella valley any more! Amazing hellebores you have there. Hardly spring but it is amazing what flowers here in a mild winter! Not so much a resessive trait, more of a less-common genetic variation. Through breeding, selection, hyribization and much patience you can get a stable dark coloured hellebore, but those that have popped up in your patch will probably be the result of luck and natural cross fertilization. The next variation will probably be different again, unless you use a technique like meristem tissue culture to clone the plant. A lot of work, but I agree the dark ones are beautiful. Your whole patch looks wonderful, great to see so many. 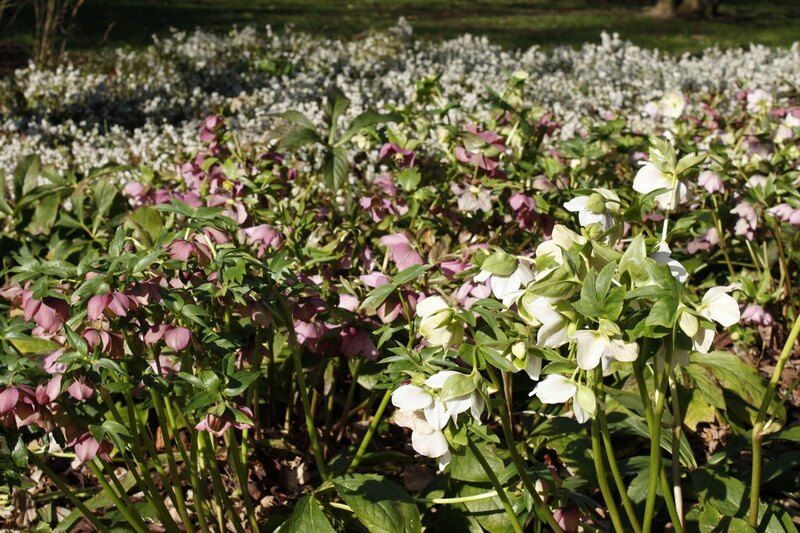 We have let a selection of helleborus orientalis go free in the woodland and it is just starting to spread out nicely. It would be nice to easily propagate this black seedling but as you say its probably a case for tissue culture - pity we can't just take cuttings! witnessed the murder of the whole forest near my neighborhood last fall. ... That hellebore is very dramatic! Some years ago the University bought land and developed the new Jubilee campus, saying that they did not wish to spoil the parkland landscape of the existing campus but despite that they are now over-developing University Park. There are some awful new buildings in dreadful locations. So often landscape and trees are the last consideration. It is so sad when mature trees are felled for brick buildings. Universities, I know have to look at ways to bring in money in different ways, but to the detriment of the environment. 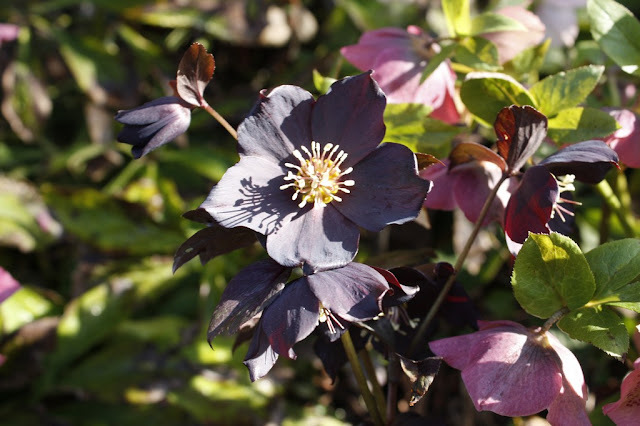 The ‘Black’ Hellebores were carefully developed from a few plants of Helleborus torquatus that were naturally dark crossed into larger flowered x orientalis strains. The two clones that Eric Smith of The Plantsman Nursery used as parents were ‘Pluto’ and ‘Neptune’. Ballard developed that line further. German nurseries have used other wild plants as the ‘black’ original parents. There is a taxonomic problem with the species name though, and distinction from H.multifidus is controversial. Modern seed raised plants are usually from well developed strains and for the black to appear out of the blue is a bit unlikely. I would guess it was a spilt seed that germinated in the base of another pot and came from another strain. Chad - thanks for filling in some detail on this subject. Still perplexed as to where it came from, as they've been planted for a number of years, so I would be surprised if the seedling dates from the original propagation stage and besides they came from a very basic wholesale nursery not a hellebore specialist. Anyway - wherever it came from - its a handsome curiosity!